Come See All 14 Models In Real Life! 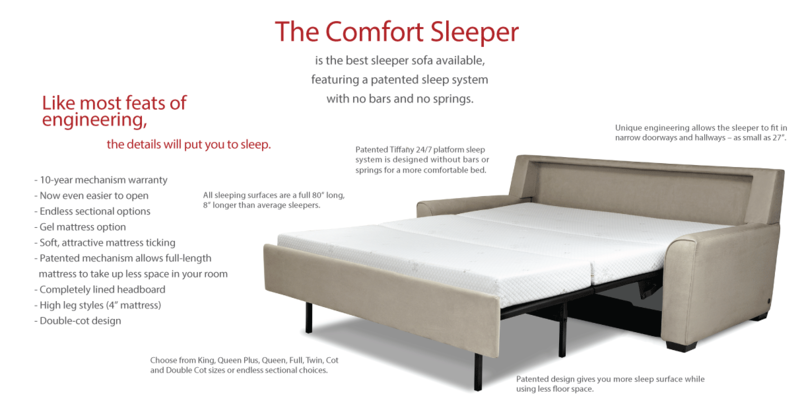 The Comfort Sleeper by American Leather is the king of all king sleepers. With a platform bed and a 5 inch high-density mattress on top, you can’t go wrong… you can depend on a good night’s sleep. With 15 different styles, multiple sizes and configurations, and over 400 different covers, there is definitely a sleeper that can fit into any room or decor. The biggest sleep space in the least floor space. Comfort Sleeper’s patented design allows the mattress to snug up to the back of the sofa so it takes up less room. At the same time, our mattresses are longer than ordinary sofa beds. We use conventional lengths so you can stretch out. + WE’RE EXPERTS AT DELIVERING THESE! And we can haul away your old sofa, too!